The problem with an engine card is often that if someone blows it up, it puts a crimp on your deck and your plans for it. Alternatively, you could shuffle in such a way (or have such poor fortune) that all four copies of your vital engine card land on the bottom of your library. That may seem like an extreme example, and it is, but consider what happens when you draw thirty cards in a game (typical 60 card Magic) and you don’t see a single copy. Do the math. You may not like the results. So EDH then gives us a unique opportunity, because we know that we are guaranteed to draw one specific card (our general), and that we can bring it back again and again. So we can pick a card like Ghost Council of Orzhova, and choose to build a deck around it, and harness its engine to bring brutality down upon people. What does that mean in a Magic context? You input fuel and output an effect. You pay your one blue mana every turn into Stasis and the output is nothing untaps. So what does this mean in the context of Ghost Council of Orzhova? Well, first, what does Ghost Council of Orzhova do? So, you can pay one, sac a guy, and blink him at instant speed. And when he comes into play, he pings someone and you gain from it. Let’s understand our engine: This guy is a 4/4 that is very hard to kill. Swords to Plowshares or Path to Exile? Blink him! Wrath of God? Blink him! Control Magic? Blink him! Keep in mind that this trick works once per every turn, so he leaves now and comes back next turn. So you’re only blinking once per turn at most. So what fuel does it run on? Creatures (we could say mana is the fuel, but if your deck doesn’t generate mana, maybe you’re in the wrong room. The Pinochle game is down the hall). There’s three possible fuels that makes Ghost Council of Orzhova optimal. One is creatures with leave play effects. This would include something like the recently reprinted Archon of Justice. You’re getting an additional effect when you sac the creature. The problem is, you only get to use this fuel once, and they’re expensive to pop out. The second, and better, type of fuel is tokens. You don’t want to sac a Serra Angel to your Ghost Council of Orzhova, because the benefit doesn’t outweigh the cost. But a simple token, a generic 1/1 with no abilities, especially a white one, is one of the cheapest and most cost effective creatures in the game to generate. You can generate many of them. Since this is the cheapest and most cost effective fuel possible, it’s the best choice to fuel Ghost Council of Orzhova. The third choice I put in the category of Other. I’ll point to three that I included in my own Ghost Council of Orzhova deck. But as I said, the main and most efficient fuel source is tokens. Fortunately, the color combination of black and white gives us plenty of great token generators, and token generation yields other benefits. In preparing to write this, I took my existing Ghost Council of Orzhova and sorted it into different piles, defined by the use of the cards, to better understand the deck. One pile I titled “Feeds the Engine” the other I titled “Fed by the Engine.” By that I meant cards that gained benefit from either Ghost Council of Orzhova, or from the token generation I included in the deck to fuel the engine. The first and more significant of these is the quartet of Soul Wardens: Soul Warden, Soul’s Attendant, Suture Priest and Auriok Champion. Not only do they benefit from the tokens you make, and every other creature that comes into play, but they turn Ghost Council of Orzhova from “When you comes into play you lose one and I gain one” to “When he comes into play you lose one, I gain two.” I make a point to say this out loud every time, not only to announce effects of the game estate, but for psychological effects. No matter how many times you tell people that you don’t win the game by having the most life, people attach out-sized importance to when their opponents gain life. So if they go out of their way to bolt my Soul’s Attendant instead of something important because I’ve said it out loud every time, then I’ve done my job. My Ghost Council of Orzhova includes a pair of anthems: Glorious Anthem and Marshal’s Anthem. The former makes your tokens twice as good, the latter is often a game breaker when used late game. Sylvok Lifestaff, that turns a creature sac into life gain. “I sac my guy, gain three life, blink my general, another token picks up the staff.” Then at the end of the turn, “I gain two life, you lose one life.” With a Soul Warden. Rinse. Repeat. Always repeat. Deathbringer Liege, which is often another anthem, rarely a kill effect. Decree of Pain, for when you lose control and need to start over. Butcher of Malakir. So, Butcher, plus Soul Warden, plus Lifestaff goes something like this, “Sac a guy to blink my general, I gain three life, you sac a creature, EOT my general comes back, you use a life, I gain two life.” Warning: This is brutal and rather demoralizing for people. So there it is. You have the engine. You have the fuel. You have the extra cards fueled by the fuel. The beauty of this system is that it can function with only parts of the whole in place. If you have tokens but no Soul Warden, it still works. If you have Soul Warden, but the general is tucked, you can still swing for lethal. If everything else in the deck fails, there’s always Reassembling Skeleton. Most of the cards have a brilliant ability to win mostly on their own, and then when combined become utterly brutal. 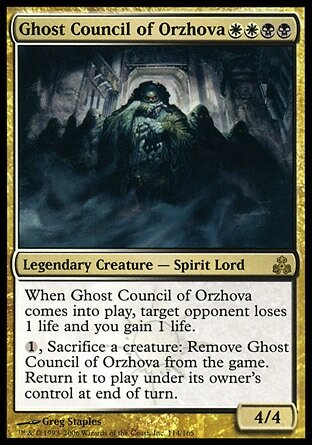 At the end of this article I’m going to post my Ghost Council of Orzhova deck list. It’s not optimal, but it’s pretty good. When a new set comes out I cram cards in if I think they’ll be interesting. Some things like Suture Priest will be permanent additions to the deck. Others, like Shrine of Loyal Legions, I included because they were new and novel, but I doubt they’ll stay in the deck. The point isn’t that I want you to go out and copy my Ghost Council of Orzhova deck list card for card (woe unto EDH should people ever start copying decks card for card). The point is, I wanted to show you the thought process that goes into seeing a card, figuring out how to make it work, and figuring out how to make what makes it work, work. EDH affords us a format that allows engines to thrive because of the reliability and utter certainty of drawing one specific card, and being able to get it back, every single game. It lets engines do what they should do and have never been able to do as consistently or reliably in the sixteen years I’ve been playing the game. So go! Get out there and build your engine deck! As promised, I’m including the deck list. This is just the current list based on what is in there as of this writing. Think about it, and think about my choices. I’m sure you could make better ones. but think about it and think about the ‘what’ and ‘why’ that makes it tick. Also: If you copy it, Imma cut you up good.